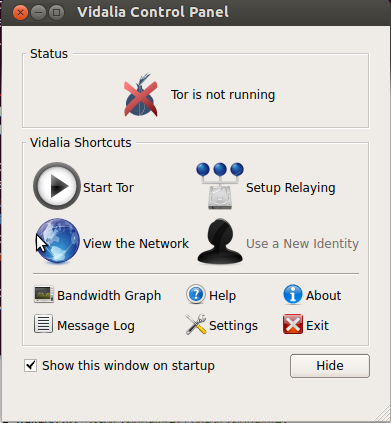 This will launch Vidalia and once that connects to Tor, it will launch Firefox. Do not unpack or run TBB as root. This description doesn’t suggest WHERE we should logically put the Tor Browser Bundle on Ubunto. Should it go in any of these in the $PATH ? Joseph : TorProject advises against “installing” the bundle as “root” (administrator), because of security issues. As it seems you need Root permissions to extract the TOR bundle to any of the directories you listed (I tried /usr/local/bin and others), the best place to extract is probably your Home directory. Also, see below. wx : good question. Torproject says there’s no need to install. It’s true it works without installing. You can always make a shortcut. Actually, the file “tor-browser-setup” is a short script, which main purpose seems to be to specify its PATH itself. Also, it seems there are 3 ways to get the right TOR archive or package. Ubuntu repositories, tor project main download page, or the hard way, at https://www.torproject.org/docs/debian (includes ubuntu). You have to add torproject to your repositories list. is a good place to get tor. Re-install on new laptop after older desktop flamed out!